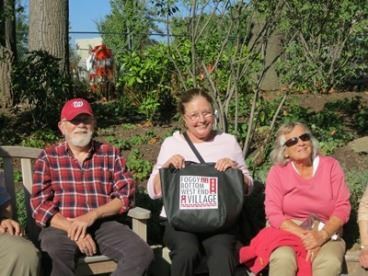 The Village’s fall tour of American University’s Arboretum and Gardens was organized by Villager Sue Headlee, Associate Professor Emerita of Economics at AU. Not only did Sue commandeer the two major figures involved in the design and maintenance of the Arboretum and Gardens, i.e. AU’s Landscape Architect and its Arborist, but it appeared that she must have had direct communications with the weather gods who gave us a glorious day. There were very interesting discussions and vivid examples of green technologies used in keeping with AU’s mission to be a leader in sustainable management of an urban landscape. Villagers were treated to such sights as a beautiful two-acre green space with an allee of Chinese elms complemented by birch, cherry crape myrtle, magnolia, and dogwood trees which had formerly been a parking lot. A below-level roof top served as a green roof for underground rooms.